Will a Chow Chow fit your lifestyle? While the breed looks like an overstuffed teddy bear, they are actually far more complicated than that. The Chow Chow is a powerfully built dog, whose sturdy frame belies his past as a working dog. Through the centuries these canines have been used to pull carts, herd livestock, and even assist in the hunt. This jack-of-all trade even spent time as the palace guard dog for the Chinese emperor. The Chow should present the impression of being square, with his height and length just about equal. The Chow's rear legs lack the angulations of other breeds and this straightness gives him his signature quick paced, yet stilted walk. One of the Chow's most famous features is his blue/black tongue, quite different from the pink tongue found in other breeds. The Chow Chow is a medium sized, heavy boned dog, and he should look ready for labor. The breed is known for its thick coat which covers rolls of flesh. 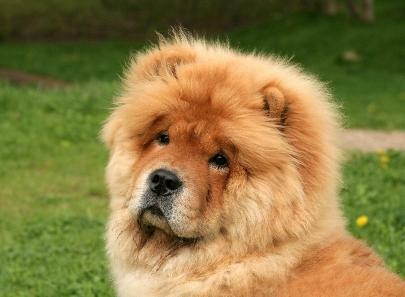 The rough coat variety is perhaps the most common and what you might normally picture when the Chow comes to mind. Ample furnishings cover the tail, legs and chest, but it's the large "rough" around the head and neck that gives this breed its resemblance to the regal lion. There is also a smooth coated variety, although it is less commonly encountered. As you might expect, Chows shed and require a good deal of deep layered brushing to keep them from matting. The Chow Chow's scowl is indicative of his serious, thoughtful nature. He is a discerning soul who will not openly welcome strangers into what he considers to be his domain. The deep fold of flesh and fur around his eyes also gives him somewhat limited vision, and this is why he is so easily startled when approached from the side. It's always best to announce your presence or make it a habit to approach this canine from an angle where he can see you. As you might already surmise, the Chow may not be the ideal pet for a family with children, although there are certainly a few exceptions to every rule. The fact remains that this is a breed that does not appreciate surprises or sudden moves. On the bright side, this breed does make a quiet house companion for adults, and requires far less exercise than other dogs of a comparable size. Chows are keenly intelligent, and can learn whatever they want to, but the key is they have to want to. A Chow considers you his equal, and will not automatically cow tow to your will unless he agrees it's necessary for the task at hand. This is a fairly long-lived breed, surviving about fifteen years on average. While they are considerably healthier than many of their fellow breeds, there are few things to watch for. The Chow Chow is definitely not a beginner's breed and you should seriously evaluate your lifestyle before acquiring one. Do you have small children who might view your new dog as a plaything? Do you entertain frequently? These are not always the ideal situations for a Chow. On the other hand, a Chow can make a sturdy, protective, and affectionate companion to those who understand his unique personality.